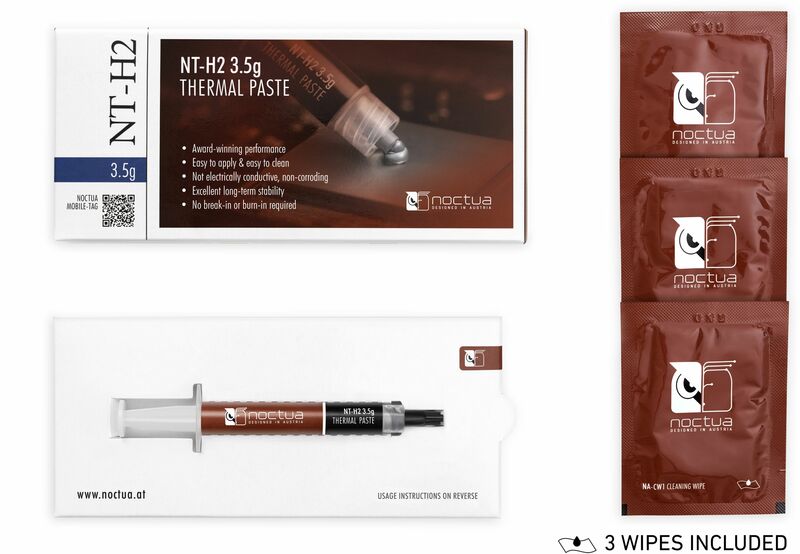 Building on the success of the NT-H1, Noctua's new NT-H2 thermal paste is an enthusiast-grade paste for the highest demands. They are available in two different sizes and accompanied with cleaning wipes! NT-H2 is the further improved second generation of Noctua's award-winning hybrid thermal compound. 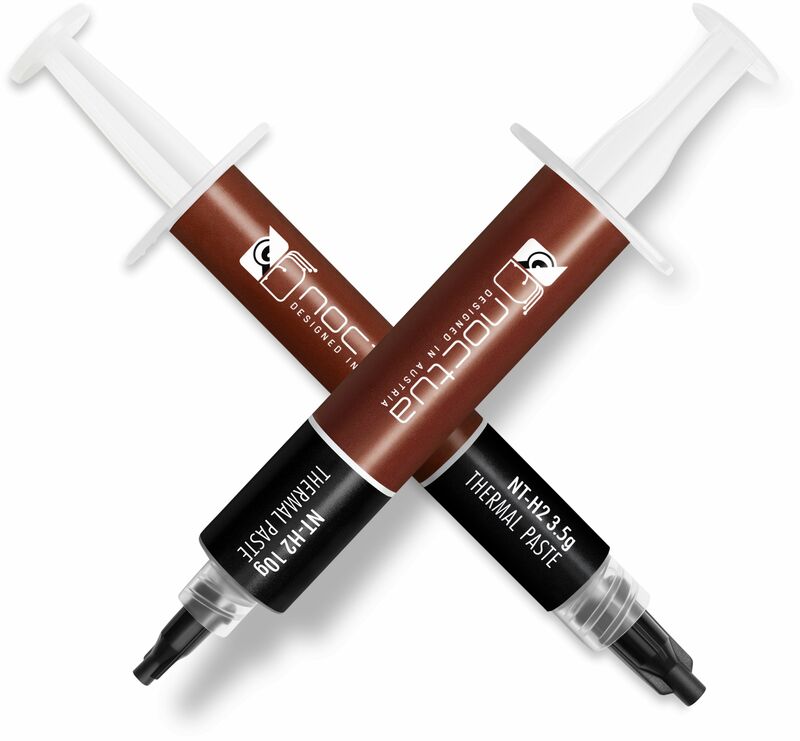 Combining the iconic NT-H1's proven features, superb ease-of-use and renowned long-term stability with a novel, fine-tuned formula of micro particles for even better thermal performance, NT-H2 is an enthusiast-grade paste for the highest demands. Whether it’s air or water based cooling, CPU or GPU applications, overclocking or silent systems: NT-H2 will consistently deliver outstanding results and thanks to the included cleaning wipes, it is just as easy to remove as to apply. 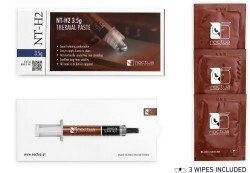 NT-H2 is based on Noctua's renowned NT-H1, which has received more than 150 awards and recommendations from international hardware websites and magazines. Chosen again and again by overclockers and enthusiast users worldwide, NT-H1 has established itself as a benchmark for premium-quality thermal interface materials (TIMs). Thanks to its excellent spreading properties, there is no need to manually spread NT-H2 before installing the cooler: Simply apply some paste onto the CPU (see instructions for details), put on the heatsink and you're ready to go! 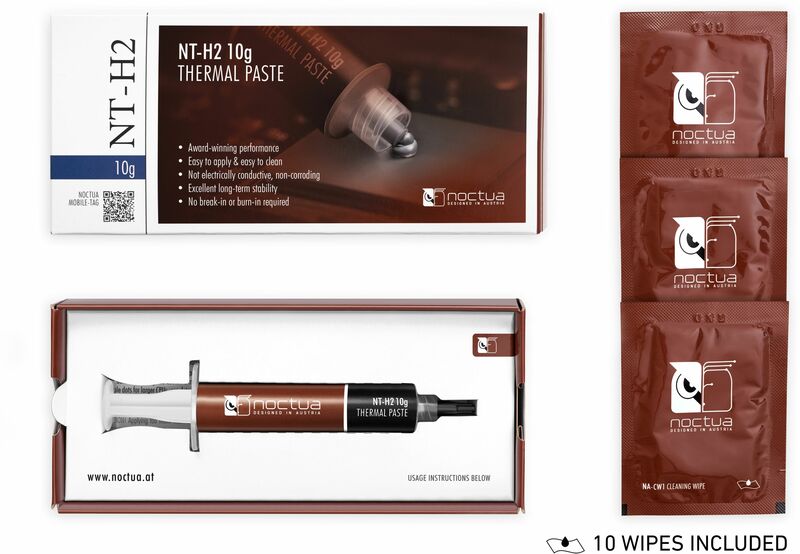 The 10g pack of NT-H2 includes ten large NA-CW1 cleaning wipes that are pre-moistened with an isopropyl alcohol mixture and make it child’s play to remove: Simply wipe off the paste from the CPU and the base of the cooler using one of the wipes and you’re done! The 3.5g version is supplied with three cleaning wipes. While some high-end thermal compounds and pads are risky to use due to their electrical conductivity or corroding properties, there's no risk of short-circuits with NT-H2 and it's completely safe to use with any type of CPU cooler, regardless of whether it's made from copper or aluminium and whether it's nickel-plated or not. NT-H2 unique formula is highly stable over time, even after longer periods of use. It can be stored at room temperature for at least three years and due to the compound's exceptional curing, bleeding, dry-out and thermal cycling characteristics, it can be used on the CPU for 5 years or more. Some thermal compounds need a longer break-in period or cure time until they reach their full performance and some thermal pads must undergo a dedicated burn-in process. By contrast, NT-H2 is ready to go right away and doesn't require any special preparations.